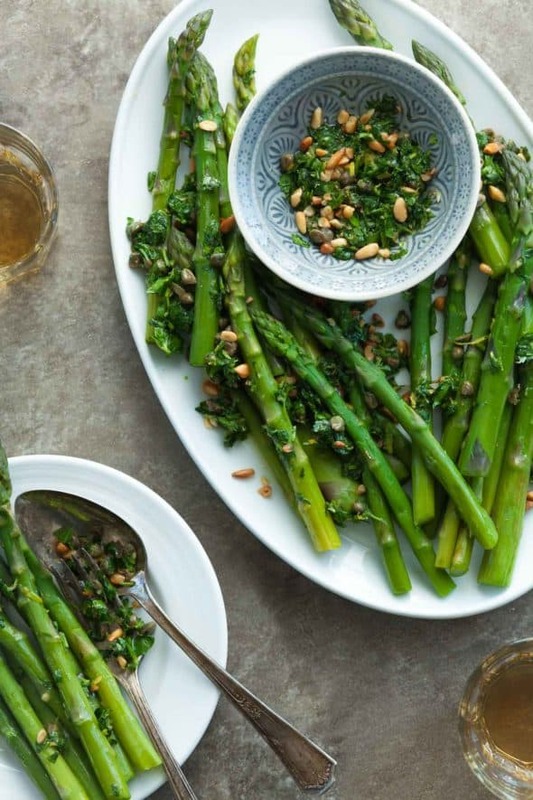 Asparagus spears get all dressed up with a lively caper, pine nut and herb dressing. There’s nothing better than asparagus while it’s in season. 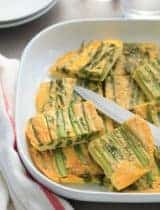 Unlike other vegetables that fare well in the freezer or are readily available year-long, asparagus is really at its best, fresh and in the springtime. I for one would be quite content to eat it every day while I can. 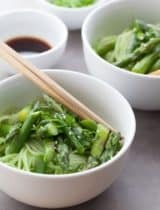 In fact there’s been asparagus on mushrooms, with noodles, pickled, in salads, and in omelettes, but most often these days it’s this simple dish with almost every meal. 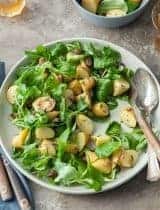 It not only works as a side but can easily be turned into a proper meal with an egg on top for breakfast or brunch or tossed in a bowl with some lentils and baby greens for lunch. As simple as simmering water, the spears are done in no time and the dressing is just as quick. 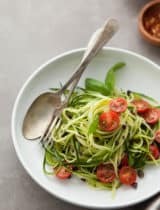 The stalks are quickly blanched in water until bright green and tender but still firm, and then tossed with a caper and herb gremolata of sorts. 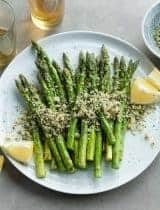 A traditional gremolata is a bright and flavorful mix of lemon zest, garlic and parsley that livens up just about everything it touches. I’ve added capers to mine for a briny kick and a swig of olive oil to make it more of a dressing instead of a topping, oh and there’s toasted pine nuts too for a rich nutty flavor. 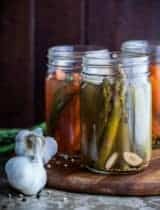 The caper dressing provides a nice contrast to the grassy sweet taste of the asparagus and a blast of flavor that keeps you going back for more. It’s one of those recipes you’ll want to keep on rotation, one that’s special enough for a celebratory meal but simple enough for weekdays too. 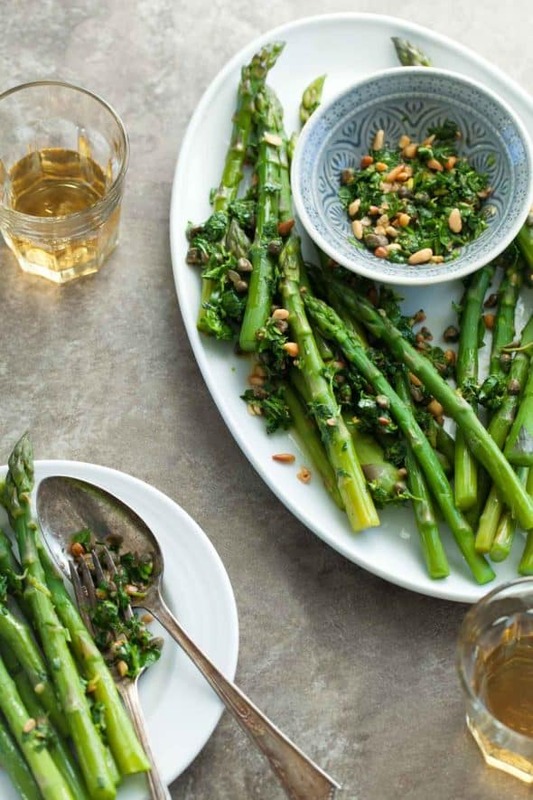 Asparagus spears get all dressed up with a lively caper and herb dressing. Bring a sauté pan of salted water to a boil over high heat. 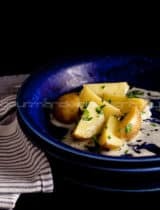 Add the trimmed asparagus stalks and blanch for 2-3 minutes depending on size, or until tender but still firm. Drain and spread on a sheet pan to cool while you make the gremolata. Mix together the chopped parsley, lemon zest, chopped capers, minced garlic and toasted pine nuts. Add the olive oil and stir. Salt and pepper to taste (the amount of salt needed will vary depending on how salty your capers are). 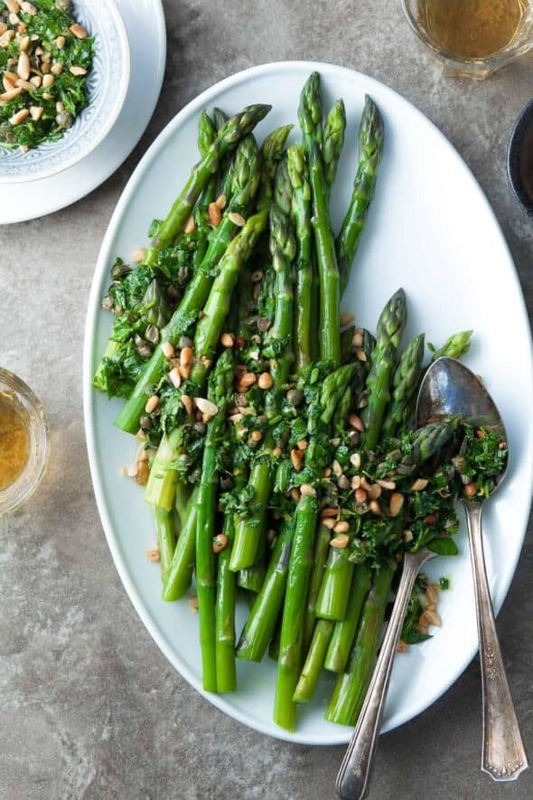 Transfer a spoonful of the gremolata to the sheet pan with the asparagus and gently toss to lightly coat. 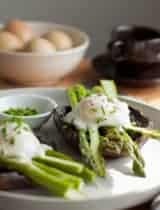 Transfer asparagus to a platter and spoon the rest of the dressing across the top. I've never made asparagus before, but I do enjoy it. This sounds like an easy and tasty side dish! That gremolata sounds awesome!!! I LOVE capers, but would never have thought to use them this way. This sounds absolutely delicious.